On Sunday I wrote an article exploring immigration and the financing of public infrastructure. In today’s article I’d like to chart different types of immigration policies and the associated forms of control. 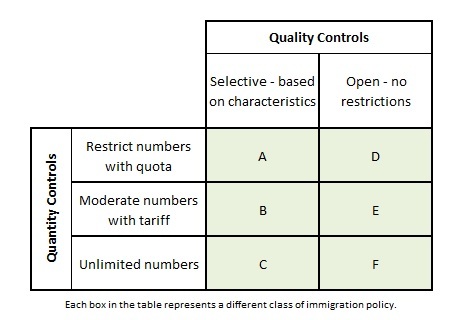 The table below has six regions marked A to F. The vertical axis of the table indicates the degree to which the policy tries to control the number of immigrants. The horizontal axis indicates the degree to which the policy tries to control the type of immigrants. The policy of a libertarian purist would be represented by the region marked “F” in the table. Under policy “F” there would be no restrictions at all on the number or type of people that could immigrate to Australia. This policy is sometimes called open immigration. A libertarian purist would want our immigration policy to be reformed to become more like “F”. Current Australian immigration policy can be regarded as being mostly in the region marked “A”. We have hard limits on the overall number of people that can immigrate to Australia in a given year. We are also selective about the type of person that can come. We are no longer selective on racial criteria like we once were, but we do discriminate on the basis of age, disability, health, technical skills, language ability, family connections etc. The reform I suggested in my earlier article would move Australian policy from “A” to “E”. Or perhaps to policy “B” but with a strong leaning towards “E”. As such I think it is correct to describe this reform as a “liberalisation” of our immigration policy. Instead of hard restricting the supply of immigration opportunities we would merely moderate the demand for such opportunities. Instead of being selective we would be more open. Note that this reform is essentially the reform advocated by the LDP immigration policy. Note that for New Zealand citizens we have an alternate policy setting roughly represented in the table by position “C”. Under policy “C” we are selective, you must be a New Zealander. However we are also unlimited in the sense that we don’t restrict the number of New Zealanders that can immigrate here. Why does the LDP advocate discriminating against citizens of all other countries when compared to NZ citizens? It doesn’t. The open immigration policy for New Zealand citizens is an existing bi-lateral agreement. It allows Australians to go the other way also. The LDP policy advocates making similar bi-lateral agreements with other nations. Not all other nations would accommodate such an agreement but where it makes sense Australia should initiate the idea. The criteria as to where it makes sense would however still be somewhat discriminatory. For instance a bi-lateral agreement with Singapore would make the grade but a bi-lateral agreement with Indonesia would not. Personally, i like A because it suggests that australia is not so desperate that we’ll let anyone in. People value what they have to struggle to get- free stuff is usually little valued. That was one of the main plusses of the movie ‘Starship Troopers’- that citizenship had to be earned. Nuke – this is about permanent residency not citizenship. Citizenship shouldn’t be given out easily. We should extend the amount of time a person needs to be a resident for before they may become a citizen. However this is a separate issue. Permanent residents get civil rights. TerjeP, I think immigrants should be as well-screened as citizens. Australia should be triple ‘A’ all the way. She already has three ‘A’s in it’s name! Nuke – why not option B? Option B is my ‘B’ plan, terjep! Indeed, my preferences would be A,B,C,D, and then E. Is F actually a policy, or a failure of policy, or complete abdication? I don’t underhand this “libertarian party” real libertarians would be clear in option F. Where is the fear? You don’t want to be invaded like your English grandfathers did with the aboriginals? you have troops in afganistan, so you have to let people from there to come here, don’t you think? The world is crap because your Europen grandfathers made them crap. Now you have a responsibility with the world. F is the only acceptable option. Immigration policy is separate to security. Screening and checks can still go on. We can have a pre 1994 refugee policy. I found some figures for current immigration costs. About $6000 for a skilled migrant.